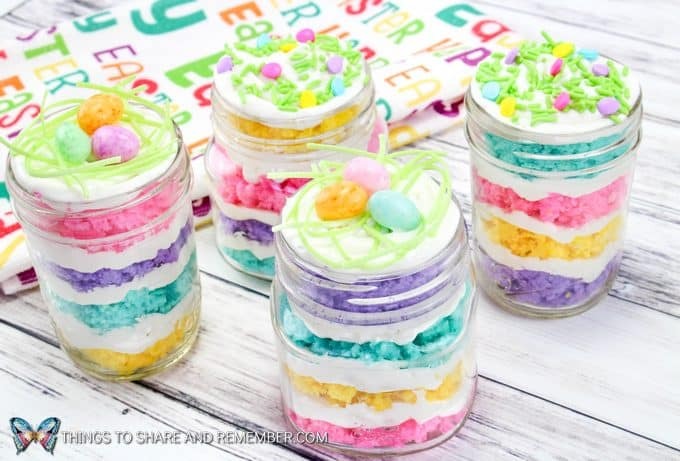 I love the colors of spring in these Layered Easter Cake Jars! 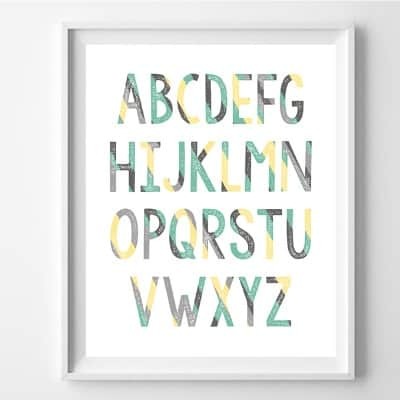 So festive for Easter and spring (even though it doesn’t feel like spring in Wisconsin!) 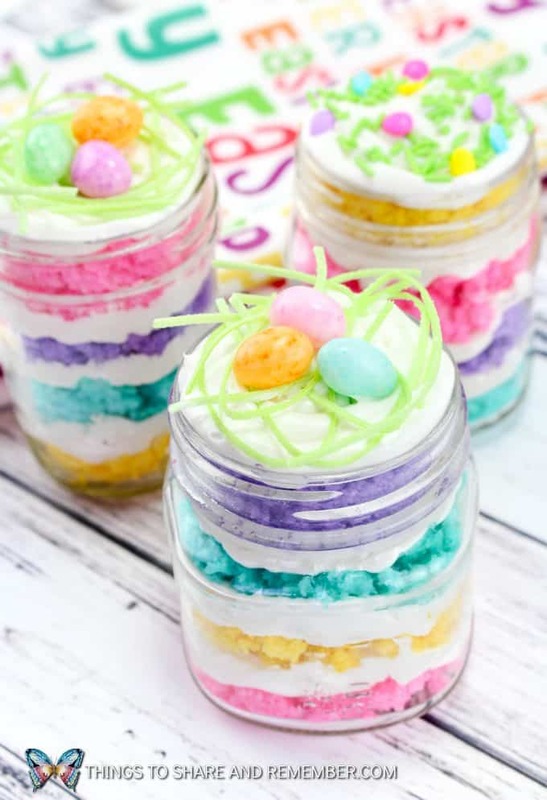 Layed Easter Cake Jars are a fun twist on a cupcake that everyone will like. Check out my Peeps Marshmallow Bunny Pudding Cups too. 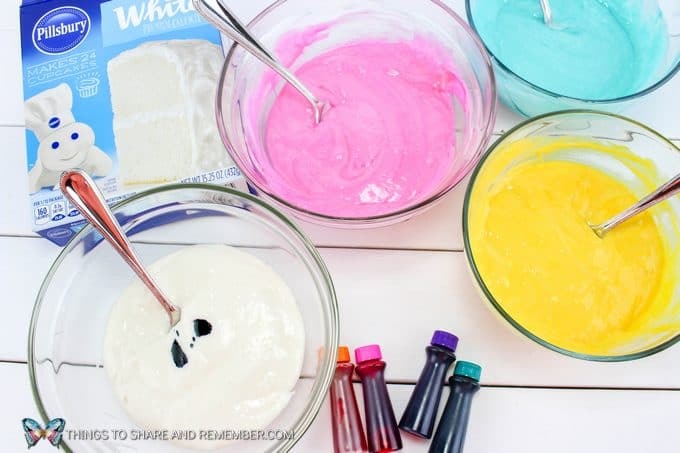 Divide the cake batter into 4 small bowls and color each bowl of batter a different color. 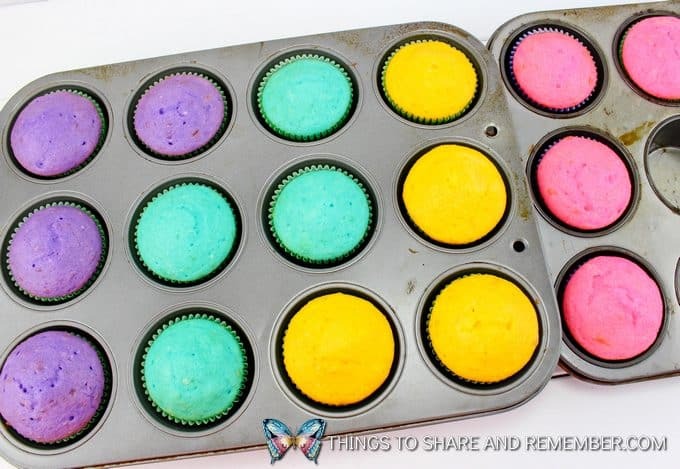 Scoop the batter into cupcake tins. 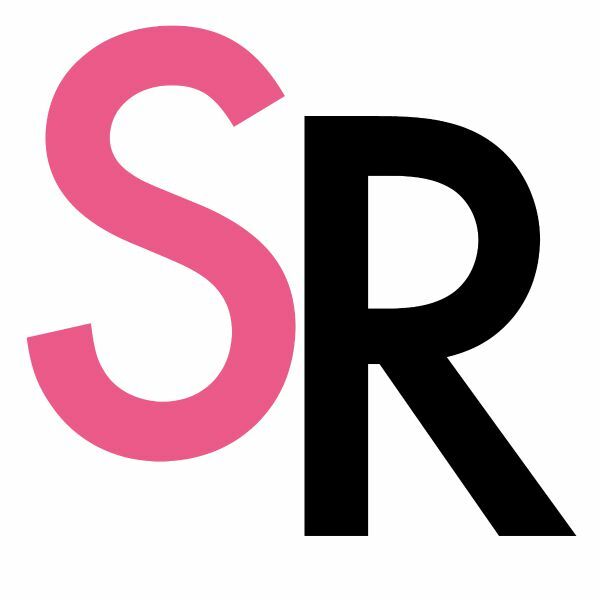 The batter will make 4 cupcakes of each color. Bake the cupcakes according to the package directions. 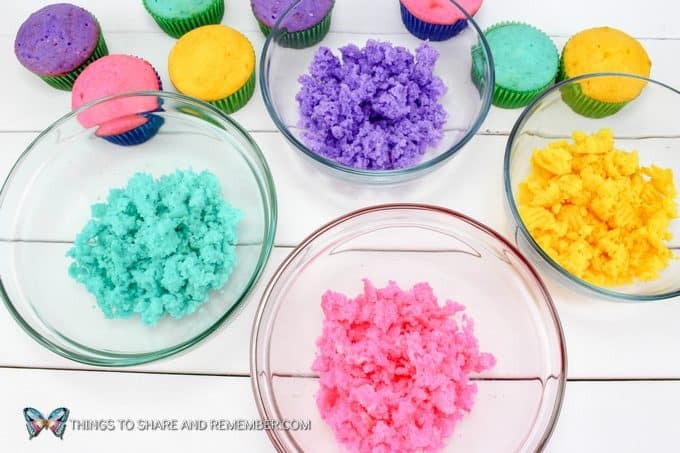 Let the cupcakes cool and crumble them into bowls, making sure to keep the colors separate. Put the frosting into a plastic bag and cut a corner off to use for a piping bag. Put a little scoop of purple cake into a jar then pipe a thin layer of frosting over that. Add another color of cake and put on another layer of frosting. Repeat with the other two colors, and the top layer will end with frosting at the top edge of the jar. Make sure the layers of frosting touch the edges of the jar, so you can see the separation of cake layers and frosting layers from the outside of the jar. Repeat step 5 with the other 3 jars. 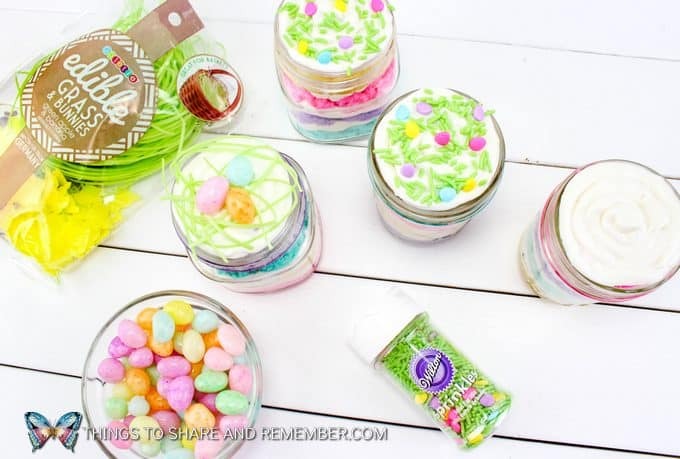 Now decorate the tops of each jar with a little edible grass and a few jellybean eggs to look like a little nest. 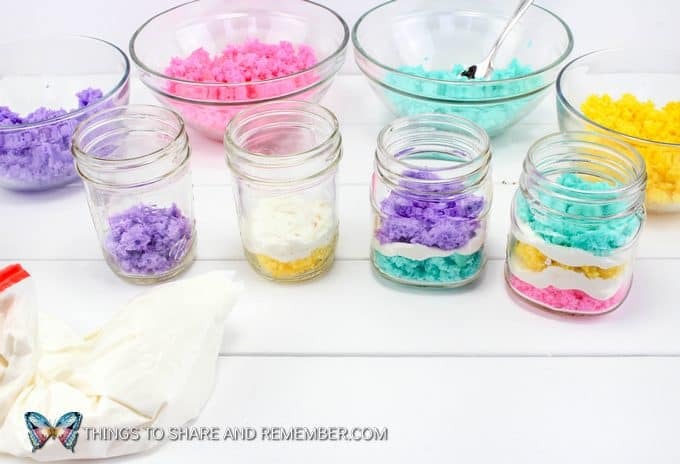 Or you can use Easter sprinkles instead and sprinkle on the tops of jars. Put the frosting into a plastic bag and cut a corner off to use for a piping bag. Put a little scoop of purple cake into a jar then pipe a thin layer of frosting over that. Add another color of cake and put on another layer of frosting. Repeat with the other two colors, and the top layer will end with frosting at the top edge of the jar. 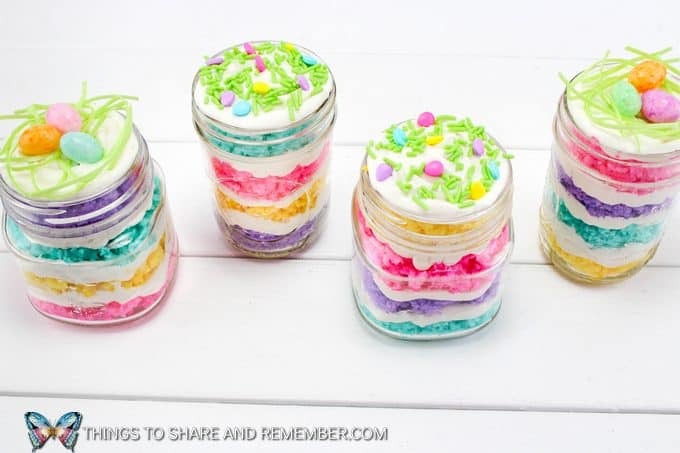 Make sure the layers of frosting touch the edges of the jar, so you can see the separation of cake layers and frosting layers from the outside of the jar.